Imagine if Mott The Hoople and The Clash got together to make a folk album with Dylan and The Pogues. Sounds messy? Sounds GREAT! 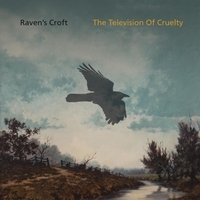 Raven's Croft marks a move from the electronic to a more organic sound for that most English of bands, The Television Of Cruelty. The album was conceived as a "back to basics" project, with emphasis on "real" instruments and a more collaborative approach. Some of the planned folky touches were lost in the making (although a specially purchased melodica makes an appearance at the end of The Fortune Teller) but the synths were kept to a minimum and the drums are definitely real, thanks to remarkable work by Dave Shaw! Jenny Williams adds beautiful backing vocals (and some much-needed glamour) and bass duties are capably handled by Graham Hills and Dave Saunders. Ian Williams plays and sings everything else, possibly because no-one could stop him. Thematically, the songs speak of loss and endings, but also of the joy of music and of life itself. Ian's long-time collaborator, lyricist John Bingham, suffered bereavement during the writing of the album, as did Ian himself, so it's not surpising that these profound experiences are reflected in the words. The music here displays Ian's usual eclectic mix of influences. The album starts with the "Spector Does Hoople" title track, Raven's Croft, then crashes through the punky reggae stylings of Dancing In The Damage before winding erratically through Indie Pop, Disco and Americana to finally settle gently to a folky conclusion. The final track, As All Days Must, was written for the Worcester Ukelele Club, who perform it here with great gusto. The album was recorded at Abbey View and Little Monkey Studios, Cheltenham. It was mixed and co-produced by Ian Williams and Dave Saunders for Mrs Poverty Productions.